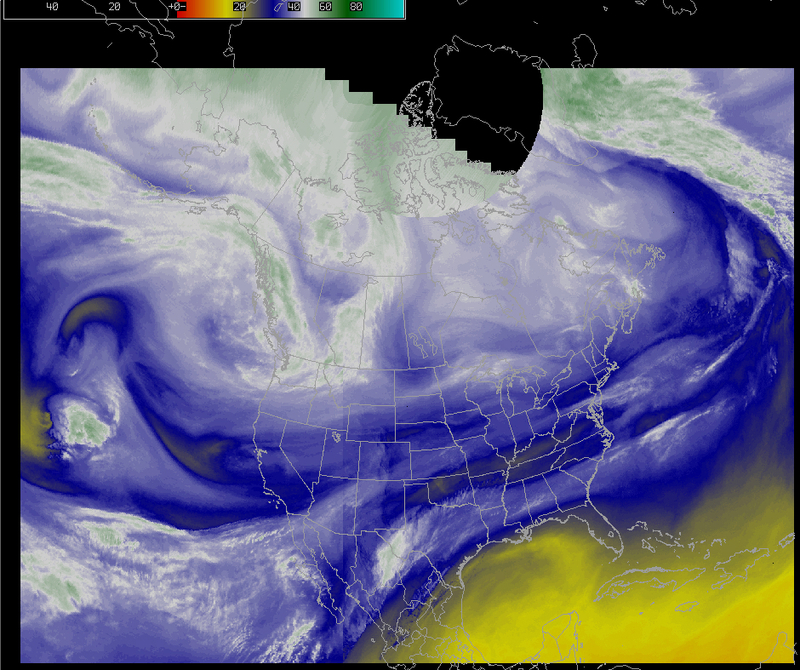 The image above shows an alternate color enhancement applied to GOES imager water vapor channel data in AWIPS. 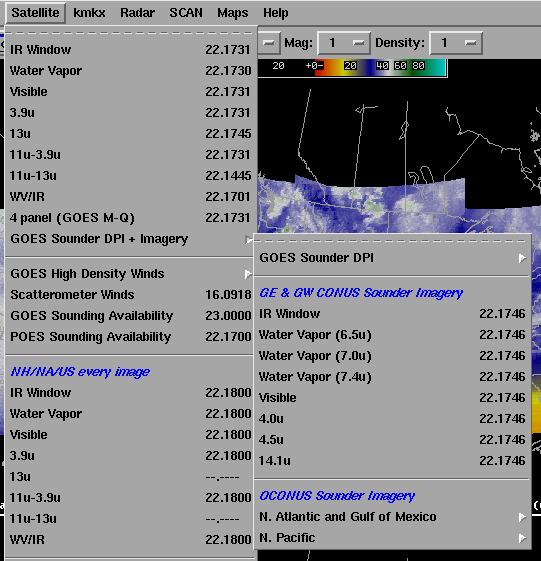 Two additional examples of this enhancement applied to GOES-12 water vapor channel data (using McIDAS) are available from 06 April 2003 and 19 April 2003.
the other numbers (40., 20., 0., -20., -40., -60., -80.) 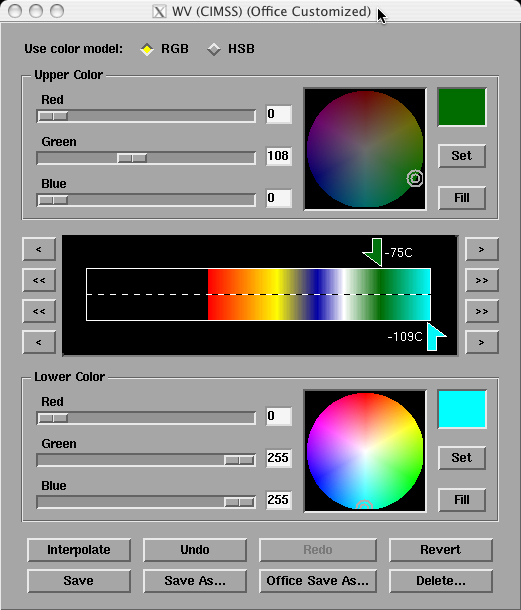 indicate what temperature labels will appear on the color bar. 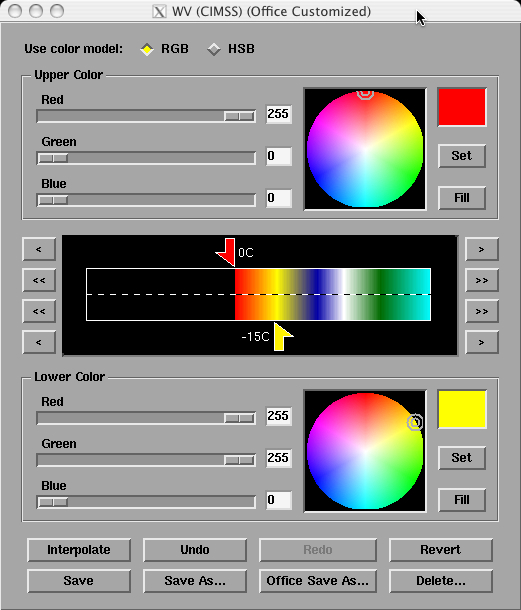 This particular enhancement is also appropriate for the 3 GOES Sounder water vapor channels (the 6.5, 7.0, and 7.4 micrometer channels), which are now available in AWIPS. 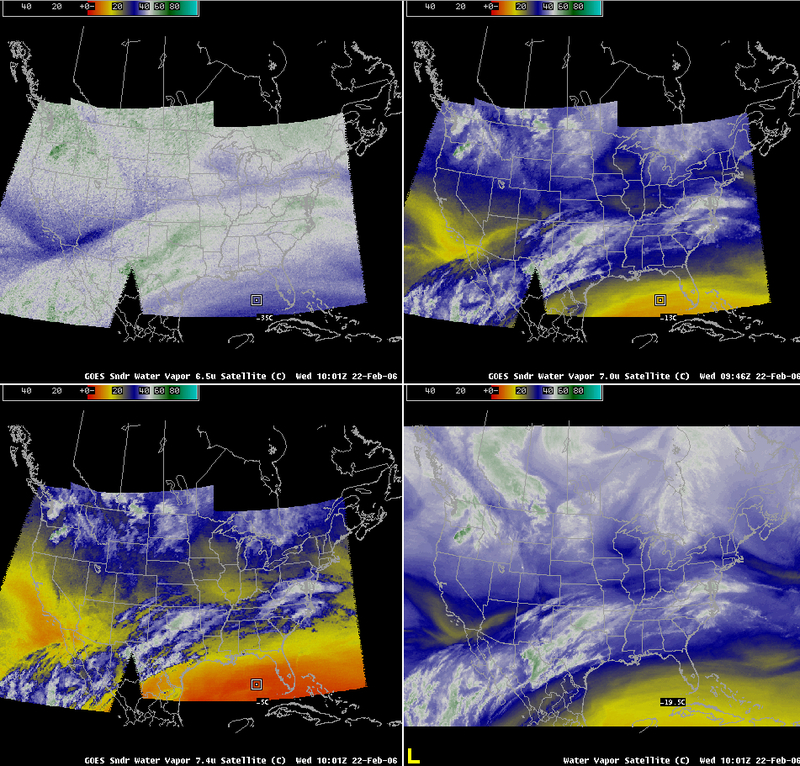 The 4-panel image above shows this enhancement applied to the 3 Sounder water vapor channels, with the Imager water vapor channel shown in the lower right panel for comparison. 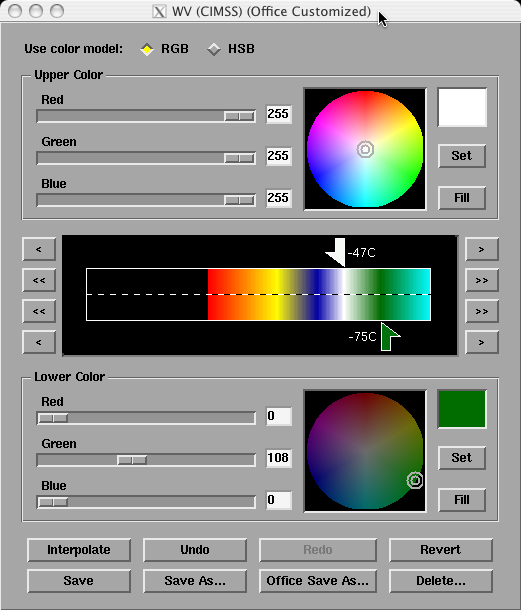 Upper left: The Sounder 6.5 micrometer weighting function peaks higher in the middle to upper troposphere, so that channel generally indicates colder brightness temperatures (white to green enhancement). 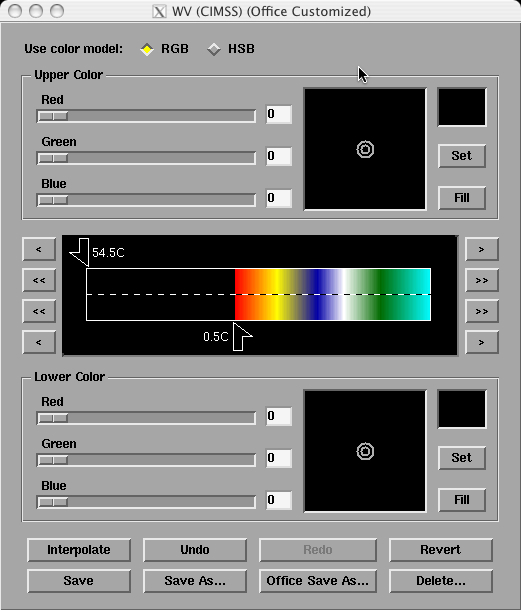 Upper right: The brightness temperatures sampled by the Sounder 7.0 micrometer channel are closer to those sampled by the Imager 6.5 micrometer channel (lower right), with warmer brightness temperatures (dryer air) exhibiting more of a yellow enhancement. 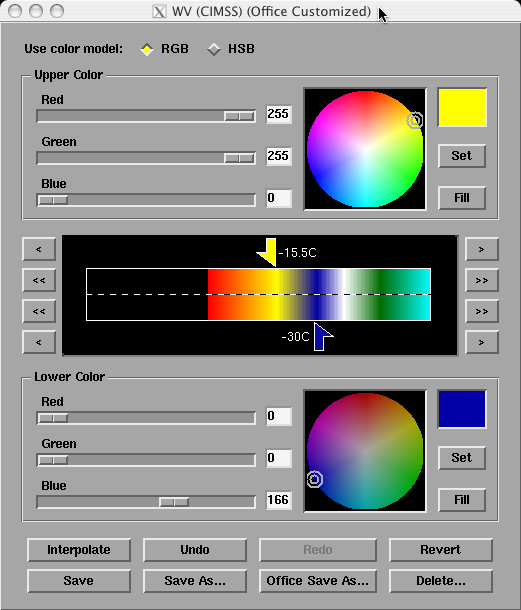 Lower left: The Sounder 7.4 micrometer channel weighting function peaks in the lower to middle troposphere, and therefore indicates significantly warmer brightness temperatures (yellow to red enhancement) compared to the other 3 water vapor channels.